This new cooling gel pressure relief mattress is the latest breakthrough in pressure prevention. Now available in 42" and 48" Widths. 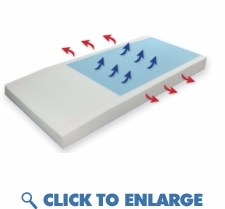 This new ground-breaking support surface provides optimized pressure redistribution, rapid heat dissipation, and vast increases in breathability compared to standard pressure prevention mattresses. Fits standard medical bed frame or twin sized mattress.